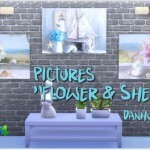 Flower Paintings for Sims 4 Download @Dropbox – LucidRayne. Say Yes to Plumbbobs! Nine floral themed pictures on the “On Phantom Wing” mesh.